Commercializing Viral Magic: Can It Work? Posted by Virginia Nussey on 09/07/2010 @ 5:43 pm | Comments Off on Commercializing Viral Magic: Can It Work? This summer’s biggest meme was born when an exuberant, hairy hippie posted a video of his reaction to two rainbows spread wide across the sky. And spread it did. Once the video went viral, there were auto-tuned songs and parodies galore, and every major media outlet wanted to snap up an interview with the summer’s unwitting sensation. So when the double rainbow video creator, Paul Vazquez, aka Hungrybear9562, was found to be shilling for Microsoft Windows Live Photo Gallery, judgments were cast that he had made a deal with the devil. Mashable posted a eulogy for the meme while others gave Hungrybear a little more credit for figuring out how to profit from his popularity. The Death of a Meme? Yes, Hungrybear, it’s hard to cross the viral-commercial divide. Then, did Vazquez slay his credibility by taking Microsoft’s offering? I don’t think so. I think the move fits with his spirit of being along for the ride, and if someone’s willing to give him a little corporate sponsorship, why not run with it? Because double rainbow was such a moving and raw moment, I don’t think following up on it with product endorsement takes away from the beauty of the original. Double rainbow is a part of people’s lives now. 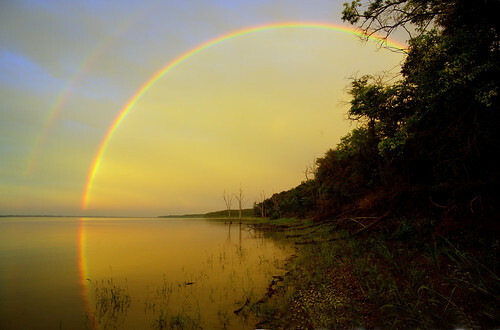 In fact, just this morning I said, “What does it mean?” and Susan replied, “Double rainbow all the way across the sky!” [It’s a bad habit of mine —Susan]. The message of the meme is appropriate in so many instances. There’s no killing the driving force behind a truly touching campaign. We’ve said it before. There’s no such thing as an original idea. And when it comes to creating sticky marketing, one way to go about it is to leverage others’ success. Now, it occurred to me this weekend, after meeting some specimens myself, that there are people who have never heard of the double rainbow video, let alone been touched by Hungrybear’s unabashed wonder. Will Microsoft’s campaign work for them if they don’t have the original reference? There’s the potential that the marketing campaign will give the viral video new life if the uninitiated search for the root of the campaign, but the ad as it is probably won’t work if the cultural touchstone isn’t already in place. It’s also worth noting that sometimes chasing that rare viral vehicle for marketing efforts isn’t always the smartest move. Sometimes it can distract you from important business goals like quality, value or longevity. But for the 14 million plus who have made Double Rainbow Guy part of their pop culture repertoire, Microsoft is using its deep pockets exactly as recommended by piggy-backing the summer’s biggest hit. Those who love the commercial and even those who don’t appreciate the business-spin will, like every well performed sleight of hand, certainly remember it. Can Viral Marketing Be Manufactured?